Smart Defrag is a free disk defragmentation utility that can ensure your hard drive is working at maximum performance. Disk fragmentation can cause many performance issues and system instability. 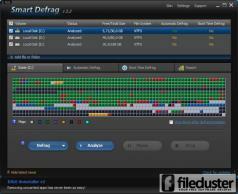 Smart Defrag was designed to efficiently defragment your hard drive and optimize disk performance. Using the latest defrag engine from IObit as well as the “Boot Time Disk Defrag” technology, Smart Defrag contains state-of-the-art defragmentation capabilities. It also uses smart functions to streamline your files based on usage frequency to boost the disk’s speed and system’s performance. Created as a “set-and-forget” application, Smart Defrag is easy to install and quietly does its job unattended in the background. - Simple installation process and automatic maintenance make it suitable even for users with little or no technical experience. - Thanks to the fastest defrag engine included within the program, Smart Defrag can defragment even large drive in just a few minutes. - Increases your computer’s performance by streamlining the file system based on usage frequency. - Free to use with unlimited updates. A tool for querying and controlling SMART data on modern hard disk drives.